I was surprised not to see more people at the press view of ‘Bangladesh 1971‘ yesterday, at Autograph ABP‘s superb new premises that opened last year in Rivington Place in London’s now-trendy Shoreditch. Produced in partnership with Shahidul Alam and the Drik Picture Library (I was disappointed not to meet Shahidul, having corresponded with him over the years, and read his newsletters, but he was held up getting his visa for Croatia) this is in several ways an important show, and one that curators Mark Sealy of Autograph and Shahidul Alam can be proud of. The show in the superb ground-floor gallery is of photographs, taken mainly by Bangladeshi photographers, of the events that led to independence for Bangladesh. One of the bitterest and bloodiest conflicts ever, many of the details are not widely known and still contested, and one of the aims of the curators was simply to provide a true account through photographs. As they state, “For Bangladesh, ravaged by the war and subsequent political turmoil, it has been a difficult task to reconstruct its own history. It is only during the last few years that this important Bangladeshi photographic history has begun to emerge.” After showing here it is hoped that this exhibition will return to Bangladesh and become a part of a museum collection there. Although it is a show with considerable photographic interest, it is also one where the historical background is vital for fuller appreciation. In an attempt to impose its will on the country the Pakistan army implemented the systematic killing of Bengali members of military forces, intellectuals and students, along with any other able-boded men they came across. Estimates of the number killed range from 200,000 to three millions (although an official Pakistan government investigation somehow arrived at a figure of only 26,000.) Similarly, estimates of the number of women raped during the atrocities cover range between 3000 and 400,000. 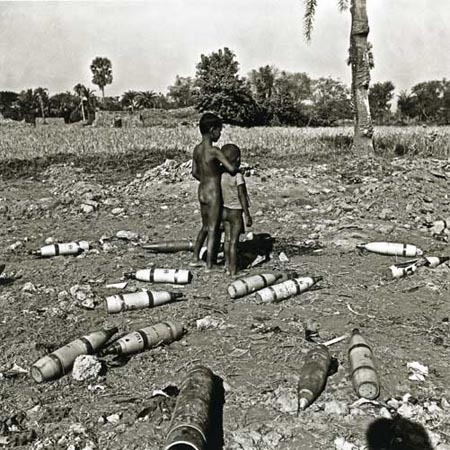 Over two million refugees fled from the army atrocities over the border to India. I also watched the film ‘Bangladesh 1971‘, part of the associated ‘Bangladesh 1971 Film Season‘ at nearby Rich Mix Cultural Centre, which includes powerful scenes from film made during the liberation struggle. We see refugees stepping through deep mud on their journey and of an old, near blind woman making her way by putting down a bamboo staff flat on the ground every few steps to find a route. The 60 minute film, produced by a group at the Rainbow Film Society in Bethnal Green, describes the events in a clear time line, with footage of some of the key scenes also covered by the still photographs – and I think one or two of the featured photographers may be seen in it. This show is politically important, and not just for Bangladesh, or the British Bangladeshi community- many of whom live in neighbouring Tower Hamlets – but also is very much relates to the British history of involvement in India since the days of ‘John Company‘, founded in 1600 “for the honour of the nation, the wealth of the peoples” of England, leading to over 300 years of colonial exploitation (in some respects little changed by independence in 1947.) The partition of India at independence was an unsatisfactory (and also extremely bloody) solution, and one which underlies the events of 1971. US support of Pakistan, both through military aid and at the UN, also had disastrous consequences, and it would be good to see this show put on in the America. President Nixon even urged the Chinese (who also armed and supported Pakistan) to mobilise its forces on the Indian border, as well as sending the nuclear-powered aircraft carrier the USS Enterprise to the Bay of Bengal. Such support encouraged Pakistan to launch a ‘pre-emptive’ attack on India, and it was the failure of this followed by the rapid intervention of Indian forces against the Pakistan army in Bangladesh that brought the war for independence there to a speedy victory. But it is also an powerful show in terms of the actual photography – and also one that relates to the politics of photography. These are pictures taken by photographers from Bangladesh, several of whom deserve to be far more widely known. Although some of the images are important simply for what they show and in other respects are typical or even rather poor press images, there are also some outstanding pictures here. There are several very fine photographers among the dozen or so included here (and at least one excellent anonymous image) but the work of Rashid Talukder (b1939, India) and Abdul Hamid Raihan is outstanding. Talukder’s work is also striking, and in many cases not for the squeamish, with a startling picture of the discarded head of an intellectual along with bricks in a puddle, or the public bayoneting of a collaborator by guerillas. 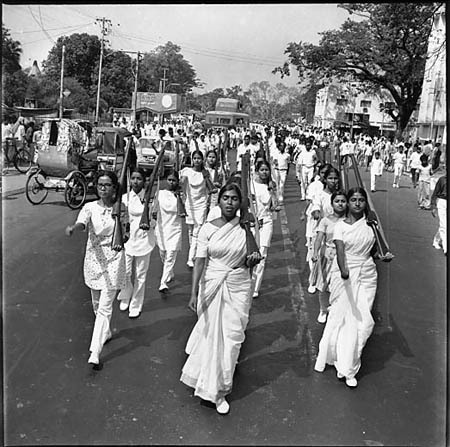 He also has a fine images of more peaceful events, including the release of a dove by Bangabandhu in 1973. Again you can see more of his work – over 90 images – on Majority World. Drik, set up in 1989 by a small group including Shahidul Alam, its name the Sanskit for ‘vision,’ has pioneered the representation of photographers from the majority world, seeing it “vibrant source of human energy and a challenge to an exploitative global economic system.” It has very much challenged “western media hegemony“, promoting work from the majority world, running education programmes and setting up the first Asian photography festival, Chobi Mela. The show – and the work of Drik – also raise questions about the future. We live in a rapidly changing world, one where India is fast becoming a leading power in the world economy, and also one where Bangladesh itself is under considerable threat from rising sea levels as a result of global warming. The exhibition opens April 4 and runs until May 31, 2008. It is hoped it may also show elsewhere in the UK. This entry was posted on Friday, April 4th, 2008 at 03:51 pm and is filed under Photo History, Photo Issues, Photographers, Political Issues, Reviews etc. You can follow any responses to this entry through the RSS 2.0 feed. You can leave a response, or trackback from your own site.